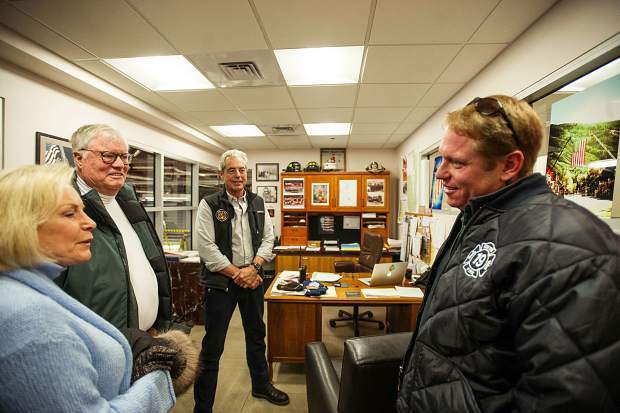 Walton Childs, center, and his wife Lee and son Brentley, right, relive the day of his stroke in Aspen 22 years ago by retelling it to Aspen Fire Chief Rick Balentine on Wednesday. 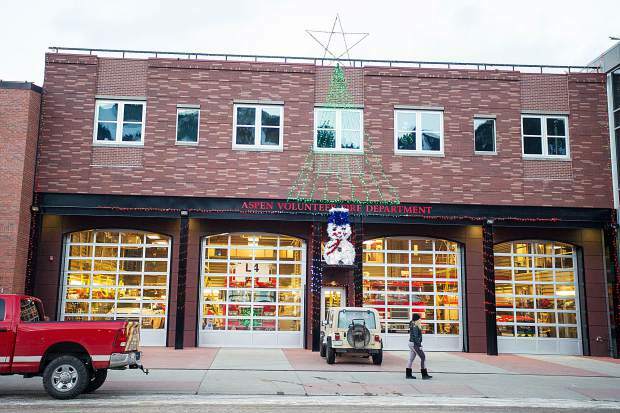 The Aspen firehouse on Wednesday evening. 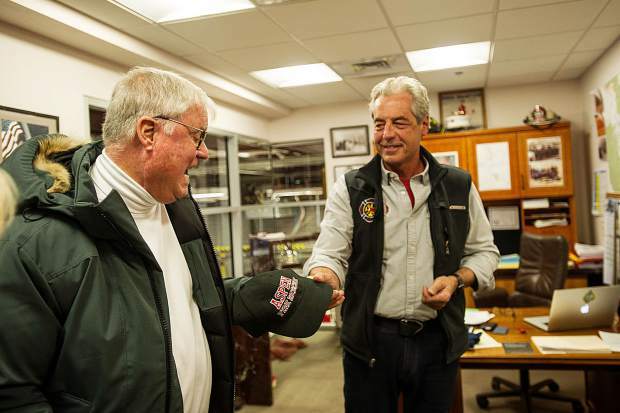 Walton Childs receives a hat from Aspen Fire Chief Rick Balentine on Wednesday evening. Brentley Childs, left, mother Lee and father Walton pose at the Aspen firehouse Wednesday evening. 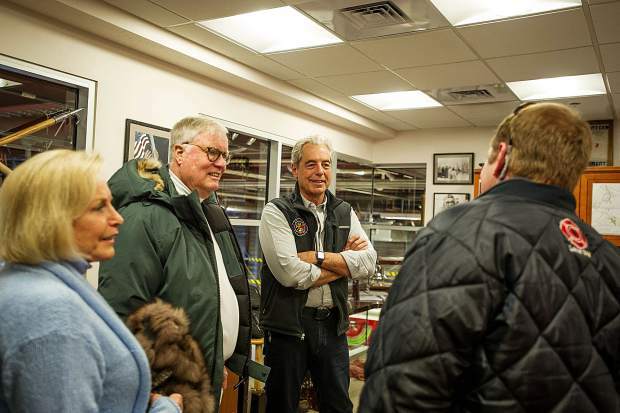 Walton “Tony” Childs and his family made sure this week to show gratitude for Aspen’s first responders, even if it was 22 years after the fact. It was some time around 5 in the morning Dec. 22, 1994, when Childs “literally jumped out of bed,” as his wife, Lee, recalled it, at his guest room at The Little Nell Hotel. She made an emergency phone call. First responders arrived shortly later, including EMS from the Aspen Fire Department and paramedics from the ambulance service. Two days before the stroke, Childs, an accomplished skier, had broken his thumb after a fall. He had surgery the following day and was given medication to lower his blood pressure. The next morning he suffered a massive, life-changing stroke. These days he walks with a limp in his right leg, his right hand not fully functional. 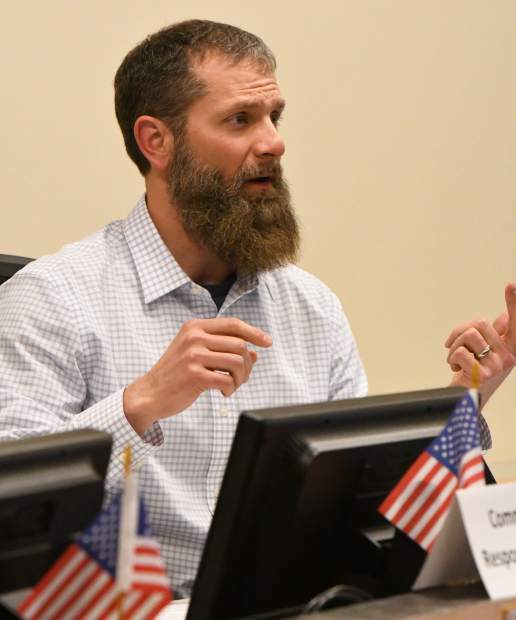 But he’s thankful to be alive — he also plays golf — and said he owes it in part to Aspen’s first responders as well as Aspen Valley Hospital, where he was initially transported before being flown to a hospital in New York. 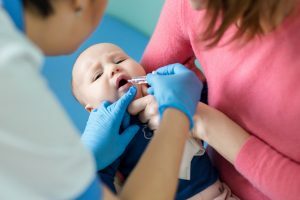 While Childs was at Aspen Valley Hospital, physicians there contacted a neurologist in Denver who came here to evaluate him. On Wednesday, the Childs couple, who split their time between Maine and Florida, and their son Brentley visited the Aspen Fire Department to show their appreciation. 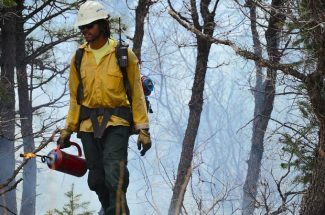 Brentley Childs, who was in Aspen with his family and was 15 years old at the time of his dad’s stroke, said the episode “subconsciously” inspired him to have a career in public safety. Now 32, he is a paramedic and firefighter in Exeter, New Hampshire, and is a ski patrolman at Attitash Mountain Resort. 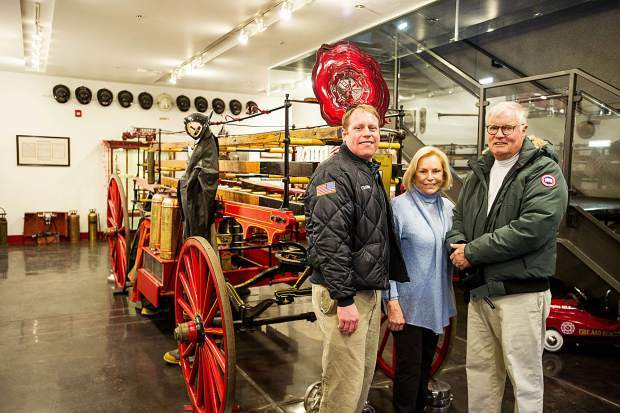 He and Rick Balentine, CEO and fire chief of the Aspen Fire Department, traded their departments’ hats and patches and talked a little shop. “I’m glad you guys decided to come back after 22 years,” Balentine said. In fact, Lee and Walton had not returned to Aspen since his stroke. They just couldn’t bring themselves to do it. They were inspired to visit over the holidays because numerous family members are in Aspen. That was the motivation they needed, they said. Walton said he underwent two and a half years of speech lessons, three times a week. “That was the most important thing, because you can’t do anything if you can’t communicate,” he said. Balentine said he did not know which first responders tended to Childs that morning. Many are no longer with the Fire Department or ambulance service. Tom Walsh, EMT-P, also was on hand for the Childs’ show of appreciation. He said he’s not sure if he was there, either. Balentine and Walsh have been first responders so many times they can’t keep count. Even so, they appreciated the Childs’ showing of gratitude. “If it wasn’t so busy at [Aspen Valley Hospital], I’d tell you to stop by there,” Balentine joked with the Childs. They elected to pass, saying they’d prefer to avoid the hospital on this visit.